“Oh, What Hard Luck Stories They All Hand Me"
Detective ShadyBrook is back and finally ready to admit that Ali got her hooks in him. 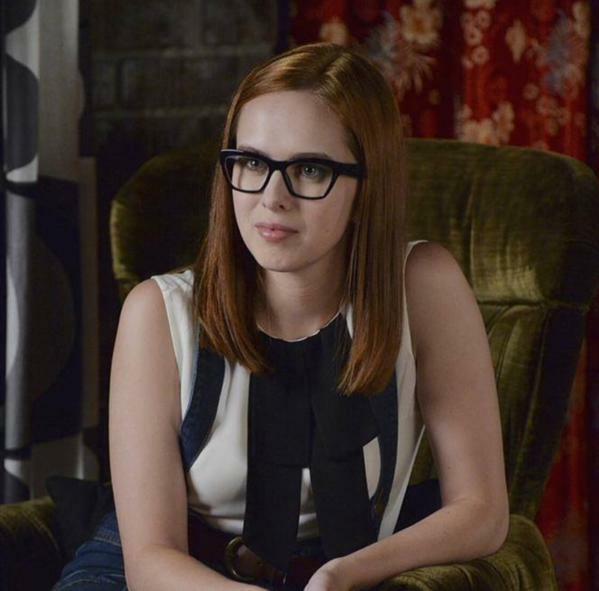 We also meet Mona’s friend, Lesli, who leads Hanna to Mona Flashbacks and big clues hiding in the spine of Poe. We also learn about Mike’s mysterious activities that may link him to Mona and Alison. However, it is Hanna the Rebel, who gives the performance of the week! Hanna and Caleb are called into the police station to be questioned about the storage unit. While they are there they see ShadyBrook get fired. He is irate as he storms to his desk to box up some of his belongings and yells, “This department has screwed up the investigation from the start, and now you’re trying to blame it on me? You have no idea what’s really going on here, do you? Not a clue” Wow, I guess I can call him former Detective Holbrook now, because that is the first true statement I’ve heard from him in a while! Aria is in disbelief when Spencer let’s her know that Mike has been visiting Ali in jail. Oh Aria, you are living up to your name of “Suzy Clueless” this week. First, you don’t know that Ezra is in Harrisburg for the weekend and now you can’t seem to grasp or admit that your brother is not little Mike anymore. Think Aria! Think! Lesli is the girl that Mona spoke to the night before she was “murdered”. (I am still holding out that Mona faked her own death) She comes to town to visit Mrs. Vanderwaal and goes to find Hanna at the Brew. Now this newcomer is one suspicious character! She tries to lift Mona’s copy of The Unabridged Works of Edgar Allan Poe. As Hanna talks with Lesli in Mona’s bedroom she has a flashback of the night Mona told her about her wish to have a stopwatch that could stop time and allow her to spy on people and control them. Later at the New Brew, Mike notices Lesli walk in with Hanna. He makes a beeline to Lesli, who is still carrying Mona’s book. (how weird) He commands Lesli to give him the book. Hanna promises Mike that she will make sure the book is returned to Mona’s room. But this interaction clues Hanna in on the importance of the book. When she returns it, Hanna has another Mona flashback that causes her to check the book and find that Mona had hidden one of Bethany’s Radley tape recordings in the spine. Hanna leaves Mona’s with the Bethany tape and is pulled over by none other than from detective ShadyBrook, who still has not turned in his police car. Hanna pulls out her crow bar before she exits the car. (Good for you Hanna! I always keep a baseball bat in the car with me for such a time as this.) In the most gripping scene of the night, Holbrook admits that Ali used him and that he lost his career because of her. Yet he tells Hanna that he had been with internal affairs investigators for the last two weeks. He told her two other important facts: 1. Tanner knows everything. 2. There must be another fall guy who almost killed Caleb, Spencer, and Aria. Hmmm…. When he grabs Hanna, she whacks him and says what we all have been thinking, “you’re the grownup police officer” why are you messing around with a girl? *applause* Bethany’s tape does inform the girls that Bethany was very angry with someone (Ali?) and she is going to set a plan in motion. Meanwhile, Aria follows Mike to a remote location and sees him leave a small plastic bag of candy. Is this candy for Bethany, A, or Mona? Did Mike secretly help Mona fake her death or is he following A’s instructions in order to get clues about what happened to Mona? During Mike and Aria’s argument, he tells his sister that he is not taking orders from anyone anymore and warns her to be careful going through the woods. This really reminded me of Mona singing Teddy Bear Picnic in Season 3 as she is painting a puppet head before going to the Halloween Train. One of the lines of the song is “Every Teddy Bear who’s been good is sure of a treat today” and it goes along with Mike leaving the candy. The part that talks about hide and seek…gives me hope that Mona may be alive!!! Let’s hope so. Until next time Liars…keep your friends close and your secrets closer!! !